2 Where do I get my soccer conditioning drills from? If you are a soccer player and are interested in pursuing it at a professional level, you will never be able to stop your training and soccer conditioning drills will be a part of your weekly training sessions. Even if you are simply playing it recreationally and want to condition and improve your footwork, you are going to have to work for it! With any sport, especially soccer, consistent training and conditioning are vital to enhance your playing ability. The moment you think you don’t have to practice, and you think you are better than everyone else, is the moment I’m afraid that you will falter. You need consistent and constant training in soccer and that will push you to be the best player you can be. There are plenty of soccer conditioning drills available to you today and I will fill you in on what your focus needs to be and what drills to concentrate on. There are multitudes of soccer conditioning drills that you can find at the tips of your fingers. With YouTube and Google, you can find the answer to any question and find multiple lists, videos, and diagrams of how various conditioning drills work. While I don’t have time to get into them all today, I want to push you in the right direction of what you should focus on. Whether you are a beginner or play at a more professional level, you must always be conditioning the basics. I know more advanced players may roll their eyes at this, but it is the truth. … and we’re going to look at each of these in turn today, and provide you with some of the best drills available. Where do I get my soccer conditioning drills from? Well, I've been a coach around the world for a few decades now, so have years of experience and hours and hours treading the turf!!! What I will say is that I also used the Epic Soccer Training ​series from Matt Smith with a number of my teams as it's a concise set of videos and tips designed to make you the complete soccer player. I recommend this series to all of my players and make sure that they get a copy so they can watch this when they are feed up of listening to me!!! This is a nice introductory conditioning drill to get your blood flowing and will help you with your overall agility and ability over small distances. The most important things in this video are the tips that Matt gives about resting, and finding the drills that are right for you. Remember, he's a pro so has been there and done this many times. 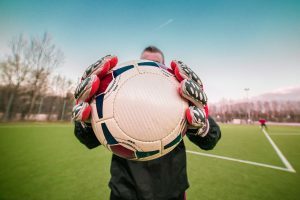 The demands on a modern soccer player are ever increasing, with a more physically demanding game, stronger players and more games per season, so working on your stamina should be the starting point of your soccer conditioning programme. A few years ago, good soccer teams could get by on skill and ability alone, however, in the modern era, you'll find that the best teams who win competitions repeatedly, are also the fittest teams. This video shows your basic shuttle run technique, which will get you out of breath in no time at all. Simply sprint to the nearest cone, turn come back to the start line, then head to the next furthest cone. You can see in these pre-season conditioning drills that the focus isn't just on continually running, but interspersing each drill with a short period of rest, to simulate real life conditions. This set of drills uses a resistance band to give that extra intensity and also throws a few different runs into the mix. Adding a turn into your dril​l or running backwards is going to be particularly important, especially for defenders, who need to be on their heels! This video features a conditioning workout for the whole soccer team and will surely increase the stamina of the players. ​Developing your strength as a soccer player is going to be a vital attribute that you'll need to have. Now, you don't necessarily need to be as buff as the guys in this video, but a bit of extra muscle will really pay off not only with your physical presence but with your stamina as well. To be a top soccer athlete you will need to be fast. Not only attackers, but defenders these days in particular need to have explosive pace to cover their backs. The two drills that I have selected above are simple techniques to improve your speed over a short distance. Using a speed ladder is an awesome way to improve your foot speed, agility and balance. Focus on precision to start with an getting the moves correct, then gradually increase the speed that you move. This video is one of my favourites out there as it shows you 14 different steps to use on the speed ladder​, that will have you dancing like Ronaldo in no time at all. If you want to float like Ronaldo and climb over defenders, or dominate your penalty area like David Luis, then you're going to have to learn how to jump. Yes, when I say jump, you say "How High?" The final thing that I'm going to leave you with today is a couple of workouts that encompass a lot of what we have talked about today. I like this workout a lot and because ​it is something you can do from the comfort of your own home. If this is the only thing you did each day then you'd have a great body as this workout focuses on building up good overall body strength, something which will be invaluable in your game. Listen to this dude and get on out there!!! If you want to succeed, you really need to push yourself and despite all the talk this video shows us 10 soccer conditioning drills, which will develop your speed, agility and stamina. Be Consistent: Doing a 15 minute session once a day is a lot better than doing a 2 - 3 hour workout once a week. Choose a number of conditioning drills that are right for you and gradually build up your speed and ability as you practice more.